Sonic Generations sees Sonic the Hedgehog playable as both the much loved classic 1991 character, and the modern day video game hero he has become in this exciting new fast paced adventure. Available on 3DS/X360/PS3…. The specifically designed Nintendo 3DS environments, based on iconic levels from popular Sonic the Hedgehog titles, will include an exclusive un-lockable Special Stage allowing players to become even more immersed in Sonics world. Sonic Generations for Nintendo 3DS will also take advantage of the StreetPass feature by enabling players to collect new content and unlock bonus material each time they pass another player. In addition to this, the new two-player versus mode means fans can battle it out across some of the most recognisable Sonic environments in a completely new way. Suitable for the Nintendo 3DS. All New Content – With new and exclusive environments for the Nintendo 3DS, including an un-lockable special stage. Each environment includes two tracks – one for Classic Sonic and one for Modern Sonic – designed to showcase each Sonics unique features. 2-Player Versus Mode – Take on your friends and earn valuable status points. StreetPass – Collect and complete over 100 missions to unlock bonus material, increasing variety, interaction and replayability. For ages 7 years and over; EAN/MPN/UPC/ISBN: 5055277014323. This toy costs approximately £14.99 (for the latest and best prices make sure you check our retailer list for the Sonic Generations 3DS above). 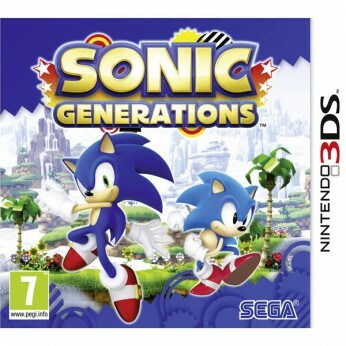 In our review of Sonic Generations 3DS we classed it as being suitable for ages 4 years, 5 years, 6 years, 7 years, 8 years, 9 years, over 10 years, Teenagers but recommend you check the manufacturer specific advice before purchasing.